Ben Vandixhorn prepares to hit a backhand. The junior will head to Durham looking to pull an upset over a top-25 team. It may be early in the season, but the young Northwestern team has already learned the importance of enthusiasm. The Wildcats (2-2) are hoping that playing with higher energy can power them to success Sunday against No. 19 Duke (3-0). After beginning the year with a tight loss to unranked North Carolina State, NU realized the importance of imposing itself early in its last win against Georgia Tech, beginning with the doubles point. Against NC State, the Cats quickly fell behind in doubles play, and that 1-0 deficit came back to bite them in the 4-3 loss. 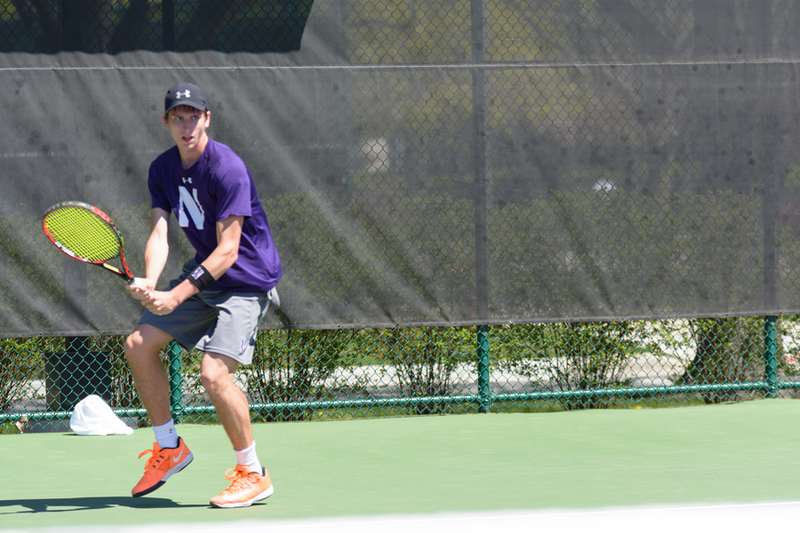 Last week, NU was far more competitive in the doubles point, including a narrow loss to No. 18 Oklahoma and an easy victory over the Yellow Jackets. The energy Vandixhorn said the team was trying to display in doubles could also help the Cats in their singles matches. In contrast to the individuality of the professional and junior circuits, college tennis is a team sport and freshman AJ Joshi said the team tries to take advantage of that. Through the first four matches of the dual season, Joshi has played three matches at No. 6 singles and compiled a 2-1 record. Joshi, junior Jason Seidman and sophomore Chris Ephron have rotated through the bottom two singles spots so far. However, Joshi said he views the competition for playing time as a positive. The freshman has played consistently so far and said he has been working on adding more offense to his game. After Joshi lost his first match of the season against Oklahoma with a lopsided score of 6-1, 6-2, Ephron stepped into the No. 6 spot against Georgia Tech and won 7-6 (7-5), 6-3. Coach Arvid Swan said the lineup changes are dictated by potential matchups rather than an attempt to ride the hot hand. “It was more of a matchup decision, who we thought they would have at the bottom of the lineup,” Swan said. No matter who is playing, matchups against three consecutive ranked opponents will require the Cats to be at the top of their game.